This is a histological slide stained with H&E of a human herpesvirus (HHV-6), a type of human herpes virus. In this photomicrograph of infected cells, the black specks indicate the location of a radioactive isotope that has been attached to the viral RNA. 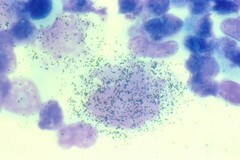 In this case, a large number of black specks indicate that this lymphocyte has been infected.